Mark Zak sports his Team USA attire outside of the Orlando International Airport before meeting up with the team in Baltimore. From Baltimore, Zak and his teammates flew to Athens, Greece for competition. As the first athlete in Hillsborough County to compete in the Special Olympics World Summer Games, Mark Zak, of Riverview, has been training vigorously for months, cycling 100 miles a week to prepare for these event to contend with 7,000 other athletes in Athens, Greece. He was chosen in 2010 through Florida’s Special Olympics program, which provides year-round sports training and competition to 15,000 children and adults with intellectual disabilities. Now, the moment has finally arrived. In mid-June, Zak left the Orlando International Airport alongside fellow athlete Michael Tauson, a swimmer from Holiday, and their families. The group met up with the 315 other athletes that comprise Special Olympics Team USA, including 16 from Florida, in Baltimore, MD. From there, the athletes left for Athens. Mark’s father, Allen and his wife, Kristen, got Mark involved with cycling after he had complications playing soccer. Mark played on Roger Middle School’s soccer team, but had difficulties running due to his flat feet. “We had never thought of cycling until the county coordinator suggested it,” Allen said. Besides drawing in athletes from nearly 180 nations, the World Games will also draw more than 25,000 volunteers, 3,000 event officials and thousands of families, spectators and journalists from every continent. Founded in 1968 by Eunice Kennedy Shriver, this is the 13th year that the Special Olympics World Summer Games are held. “Mark just wants to do his best and enjoy his time,” Allen said. Over the last four years, Mark has lost more than 45 lbs. from cycling and working out. 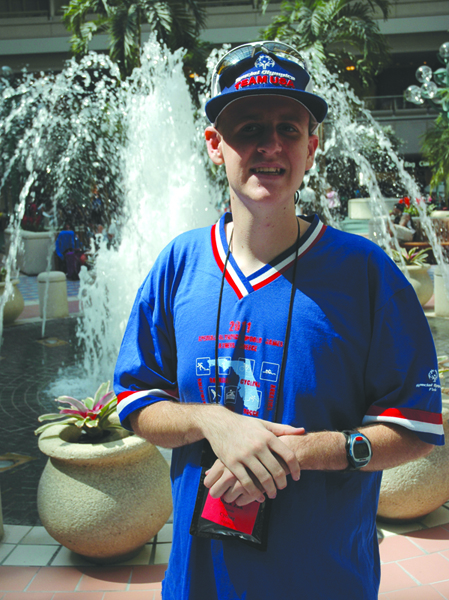 His accomplishments also extend to the bowling alley, where Mark, with a bowling average of 190, won the state championships last year for the Special Olympics in Orlando. Mark cycles for the summer games and bowls during the fall. “It is great that these kids get to share their time and talents,” Allen commented. “Although it takes them more time to master a skill, their talents are much greater than the limits we put on them,” he added. To follow Team Florida, visit www.facebook.com/specialolympicsflorida, and meet the team at www.specialolympicsflorida.org. The official Special Olympics World Summer Games Website is www.athens2011.org/en/.